- Inria woks present in French Sénat SH No 14 (concepts). - Ubicomp 2002 proceedings AH No 83 (concepts). - Ubiquitous computing. October 2001 issue of Upgrade. UGC. User generated content. Important for games, "second worlds" and transmedia. Uncanny valley. Wikipedia The problem you meet when man representaitons become more realistic. A concept forged by Masahiro Mori. < The Uncanny Valley in Games and Animation. CRC Press 2015. 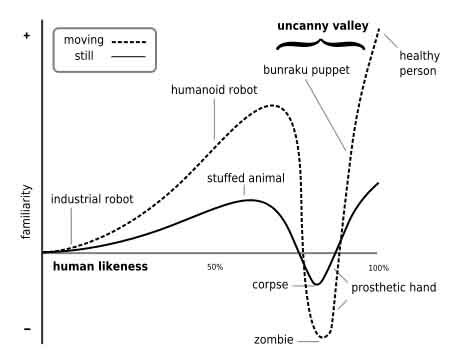 Deep digging review of research and conclusion on a fundamental question: "Will We Ever Overcome the Uncanny Valley ?". < The Uncanny : Experiments in Cyborg Culture. edited by Bruce Grenier. Vancouver Art Gallery/Arsenal Pulp Press 2012. - More in French . - Picturing uncertainty : from representation to mental representation, par Barbara Maria Stafford. 16 pages dans [Grau]. Unicode. A characer codification standarg AH No 127 (concepts). Unsharp . Mask. See [Brinkmann], [Gonzalez]. UST. Unité sémiotique temporelle (Temporal semiotic unity) . See Rix.